i've completed Year Of The Dragon 117% at least 5 times and I wanna try some glitches and cheats, like swimming in the air, glitching Spyro into a cutscene/another character's world, if anyone could tell me how to do them? I've seen the one where as Spyro is burning on lava and you pause and exit level right as you touch the lava with no Sparx, you become invincible, and if you are swimming when you exit, (like in Evening Lake) you stay swimming in the air when you go above water. Or try seeing if you can fly out of bounds with the flying powerup in Sunrise Spring, and swim in the air by going under the level. Then I think you can enter Sheila's Alp without buying her. For that matter, I wonder how many times it's possible to skip paying Moneybags, and what happens at the end of the game when you get your gems back if you don't pay him. Hmmm, that'd be interesting. - Bamboo Terrace; dive at the edge of the waterfall. - Dino Mines; Have Zoe zap you while underwater then kill yourself. - Evening Lake; Torch Spyro in the lava in Fireworks Factory until Sparx is gone. A second before the death torch hits, pause and select 'exit level'. It can be done in Sunrise Springs and Midday Gardens as well, but I've not attempted it. Refer to Youtube. - Sheila in Sunny Villa; glide from the whirlwind to the side of the tower containing the portal, carefully tip toe around until you reach the back of the portal which you'll be able to enter from. - Sgt. Byrd in Molten Crater; glide from the bridge stake to the top of the portal, you'll be able to enter. - Bentley in Bamboo Terrace; use the swim in the air glitch and "swim" into the out of bounds behind the portal, the swirl will be visible and accessible. - Agent 9 in Fireworks Factory; jump down from the edge of the ditch and as soon as Spyro's head brushes the ceiling, glide to the top of the portal. It's tricky but possible. There is a Secret Room containing a life in Fireworks Factory and an abandoned mini-game area in Dino Mines. See CrystalFissure's Youtube Channel for how to access them. Here is a complete walkthrough of all the ways you can avoid paying Moneybags. Well, almost complete, this vidder apparently wasn't aware of the loophole to the Agent 9 game in Fireworks Factory. Cool, thanks Spock! I might try some of these as well. For whatever reason, although I love breaking Spyro 2, I usually play by the rules in Spyro 1 and 3. It'd be fun to change it up. In addition to what others have said. 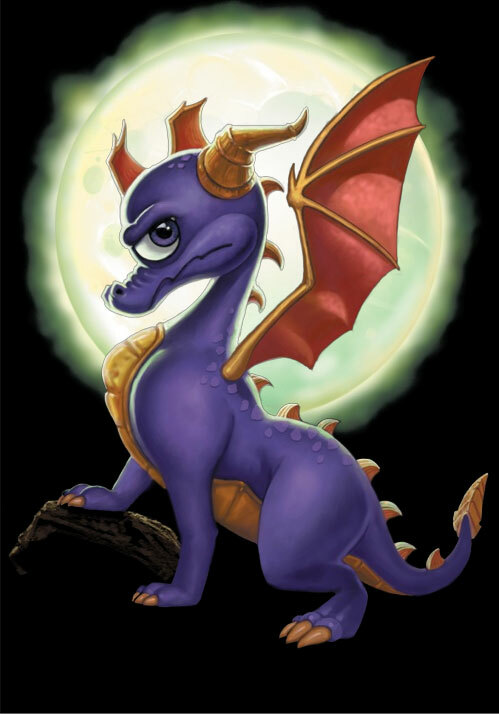 My favorite will always be this little thing known as Agent Spyro. It's where you get into Agent 9's area in Fireworks Factory as Spyro. This can be done in a few other places; Sgt. Byrd's part of Charmed Ridge, Bentley's part of Crystal Islands, Sheila's part of Seashell Shore. Getting the end of level egg in Spooky Swamp from a certain angle causes a funny little thing to happen. It is possible to swim in air in Lost Fleet, but only as long as the invincibility powerup lasts. Pausing and unpausing rapidly during the Bluto fight has a pretty crazy result that you just gotta see for yourself. Arguably more of a corruption than a glitch but a certain sequence of events in Crystal Islands can create weird visual effects. Combining this with the Bluto glitch is quite the adventure. There are definitely more that I'm not thinking of but when I do I'll post them here. I kinda spend a lot of time messing with glitches in the Spyro games. If you watch an Any% speedrun of this game you'll see tons of glitches all over the game. The Fireworks Factory/Evening Lake glitch is one of my favorites! You could use the swimming-in-air to get half the eggs in the homeworld without even trying. You can also get into Hunter's cage from the cutscene (which isn't solid at all) and the inside of the whale (which is solid, but can't be escaped if you enter it from out of bounds). The game acts very odd in this state, likely because spyro is in some sort of limbo. You can't pause, can't gain health, and some objects don't work right. I don't think someone has brought this up either, but you can use the air swim in Dino Mines to get into an unused area. Once you manage to activate it, swim over the level and head back to the area just before the underwater section. Make sure not to actually go through the water, or the glitch will wear off. Once you're here, swim over the mountains that make up the border of the level and you should see the faint swirl of a minigame portal. Touching it takes you to an empty fenced-in area that you can exit by stepping into the center. A YouTuber actually played around with this using glitches and other means. If I remember correctly he couldn't play through some of the bonus characters' main worlds (Agent 9's Lab for example) until after he defeated the sorceress but he completed a good bit of the game. When it finally came time for the Moneybags chase you still had to chase him but when you hit Moneybags nothing flew out like it usually does. Sadly I don't remember the YouTuber's name or what he called the mini series he did on it. Sadly I don't remember the YouTuber's name or what he called the mini series he did on it. Was it CrystalFissure? It seems like something he'd do, and I do recall him having a series on Spyro 3 exploits and such a few years back! That'd definitely be a great place to look for ideas on how to break the game. I remember the Bluto glitch happening to me twice by accident. I used to think there was something wrong with my disc.